The one, and most powerful word that comes to mind, when I think of designer Jorge Penadés' work and his practice. His work isn’t just beautiful, or vibrant, or innovative, or entirely suited for a constantly changing, shifting world–It is all of those things, and it is inherently, and deeply, open. By open, I mean first and most simply, that many of his creations are flexible or adaptable– the user assembles and disassembles them, and adjusts them over time. Moving one step further, some of Jorge's projects–both components and techniques–are open to designers and educators to implement and tweak as they please, magnifying the range of outcomes and applications. Finally, and perhaps most importantly, Jorge’s practice is quietly but definitively open and interactive to the socio-economic context of our world today. His most recent, and ongoing project Structural Skin (seen above) transforms the offcuts of the leather industry into a new, hard and durable material, which becomes the beautiful and unusual bones of furniture and other interior objects. Here Jorge responds to a fast-paced disposable world by consuming its still-valuable discards; While elsewhere, in his Nomadic Collection, he creates versatile pieces intended to survive and serve this constant movement and change. In Détournement–inspired by the method created by Guy Debord and Gil J. Wolman in the 1950's–Jorge looks to a condition that is prevalent all over the industrial landscape today–row after row of underused standard shelving. He reappropriates this shelving and generates alternative applications in furniture and pedagogy for a familiar, but undervalued system. 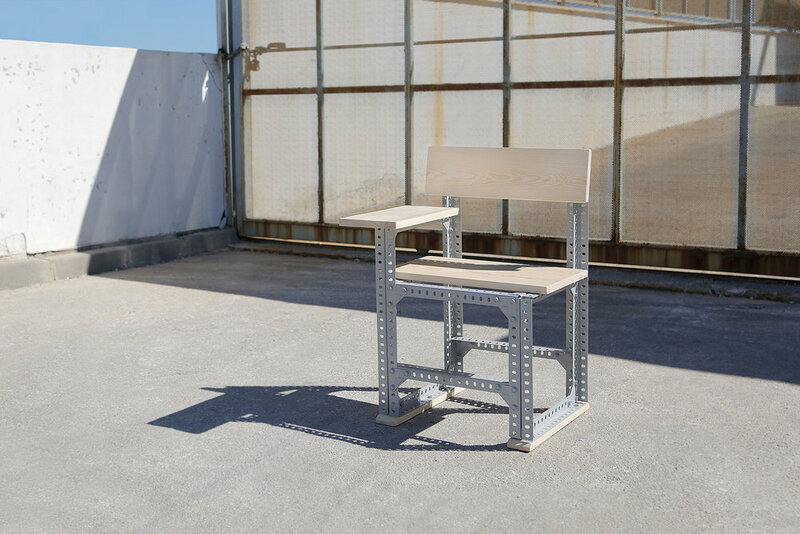 Jorge Penadés' Nomadic Chair, seen unassembled, and portable here. Each of these projects is born from being aware of, and open to such contexts and scenarios, and the result is the creation of materials and products that are open in nature themselves. Jorge's open-source and regenerative approach to design is also inherently circular and is well-aligned to a circular economy–where materials and objects do not have a linear life. Instead, the goal is to maintain the highest value for them at all times. The Spanish designer’s work is immensely celebrated, and can be seen in museums, galleries and design venues such as the Vitra Design Museum, National Museum of Design (Stockholm), Museo Nacional de las Artes Decorativas (Madrid), Museu del Disseny (Barcelona), and Villa Noailles (Hyères). He also continues to exhibit his work at Milan, London, Stockholm, Berlin, Prague, Lodz and Dutch Design Weeks. Yet, Jorge's work and attitude remain grounded, and aware of the role that designers should play in a post-crisis Spain and world as a whole. Here is our recent interview with Jorge, as part of recently begun "Design for a Circular Economy Series." MD: Jorge, from the 'Nomadic Chair' to 'Détournement', your work empowers the user (as maker), and responds to the need for flexibility and change today. How did this become core to your work? Jorge: To some extent I think it is because I have lived in six different cities during the past 12 years, so it has been a very natural process, emerging from my personal circumstances. MD: Your work, to our mind, embodies the values of a Circular Economy. Do you agree? And are these larger phenomena–from society and the economy–on your mind when you conceptualize new projects? Jorge: I definitely agree. We are facing a time where the idea of accumulation is directly related to success, and therefore happiness. But at the same time, we can, most of us, recognize that we are living in a very asymmetrical reality; very few people benefit, while the rest suffer the consequences. That´s why I think it is crucial to contemplate and reconsider what the criteria are, that should govern our future generations. 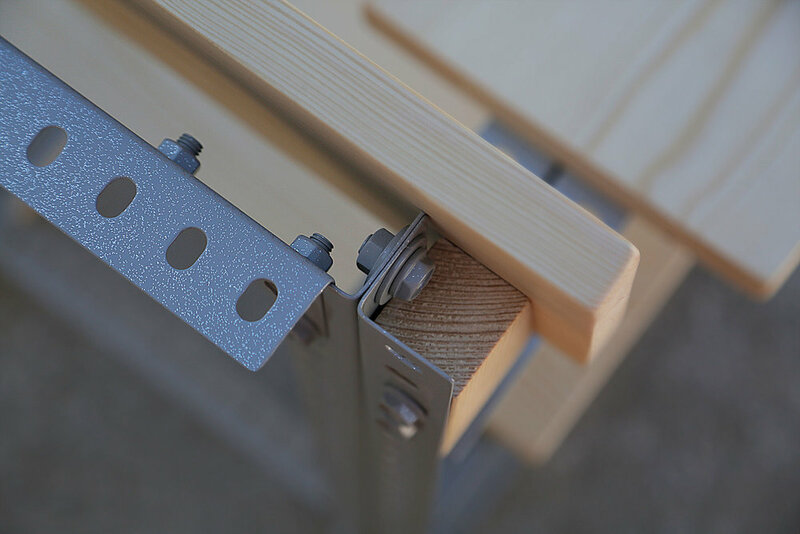 Jorge Penadés' Nomadic Chair–a versatile and flexible furniture piece, based on a detachable structure without screws, nails or glue. MD: 'Structural Skin' is an ongoing, evolving project and investigation for you. How did you first come in contact with the leather industry, and realize the potential of its off-cuts? Jorge: When my father retired a few years ago, he started to create small leather objects. On one of my visits to him, I saw a plastic box full of beautiful offcuts and asked him what he would do with them. His answer was: “I will throw them away.” That was what sparked my curiosity about this material. Regarding the methodology of this project, I always follow the same process in all of my work. The first, and most important step is to gather information; the more information you have, the better questions you can ask, and the better the questions, the more intelligent the proposals. After that, the process is intuitive, I choose a direction which I think could be interesting, and I develop a proposal. Structural Skin by Jorge Penadés. MD: From narrow slats to larger flat surfaces–the format of Structural Skin is evolving. What future would you like to see for it–both as a material, and process that you have developed? Jorge: That is precisely the interesting part of creating a new material: its almost endless possibilities. Not just the format of output, but also the manufacturing techniques that you could apply to it, the shapes, the colors–it just depends on the context where the material is going to be used. With regards to the future of Structural Skin, I would personally love to work with companies that can actually up-cycle large quantities of leather offcuts and leftovers. MD: For 'Détournement' your inspiration comes from the idle infrastructure (shelving) found in warehouses today, and how they can be turned into a modular, easily-constructible assembly. How did this infrastructure emerge as an opportunity for you to reframe? Jorge: The inspiration for this project comes from theoretical research I did back in 2015, as part of an essay I have been working on since then. Looking into the idea of appropriation, I found Détournement–a method created by Guy Debord and Gil J. Wolman in the 1950´s, which consisted of turning expressions of the capitalist system and its media culture against itself; this principle gave birth to the project by me. It was more about finding alternative opportunities for this inexpensive and versatile system than literally reusing existing shelving. MD: In 'Détournement', by opening your project and product up to other makers and users (for pedagogical use), and by supplying spec sheets and manuals to them, you are spearheading a kind of open-source design. This isn’t common for most designers. When and how did you to follow this open-source approach? Jorge: Since I haven´t invented this construction system myself, I felt I had to give something back, that´s why I decided to work on a DIY collection of objects. And to further emphasize the ethical quality of the project, I additionally offer any like-minded organization the possibility of designing ad-hoc pieces for themselves, without assuming any financial compensation. In my opinion, the goal of a designer is not just to make tangible outcomes–that is a way of approaching design, but not the only one. There are so many ways in which designers can intervene: asking questions (curating exhibitions), generating knowledge (writing), creating new opportunities (experimenting) or producing recipes with which people can build their own objects according to their needs. MD: What are you working on right now? Jorge: Even though I would love to explore new ideas at the moment, the Structural Skin (SS) material still keeps us very busy at my studio. Currently, we are working on a new collection of smaller objects with the SS material, that will be presented in Milan in the coming weeks. MD: Thank you so much, Jorge! It was wonderful learning more about your work! Readers, follow this link to Jorge's website, to continue exploring his work.